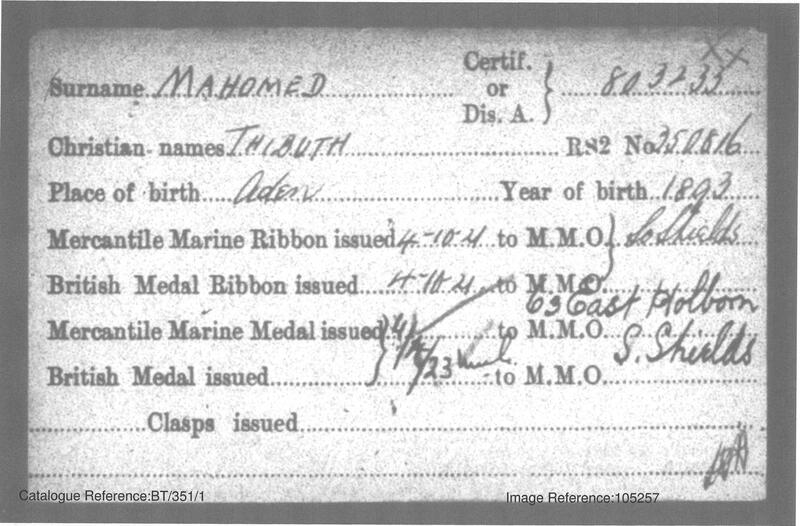 Thibuth Mohamed was a seafaring man born in Aden. The sea brought him to the North East as he worked on the ships. He lived at 63 East Holborn, South Shields, where Arab boarding houses had sprung up over the years before the First World War to cater for the growing population of Yemeni sailors. Once war broke out, there was a growing demand for seaman on merchant ships as the British Navy fought the enemy. These Arab seaman classed themselves as British subjects and answered the call to serve. Mohamed and others serviced as a firemen and trimmers in a number of Merchant Navy vessels during the First World War. From his discharge records of 1918 (accessed here), Mohamed’s character was repeatedly recorded as ‘VG’ meaning ‘very good. He was later awarded the Mercantile Marine War Medal for his active service during the war.